Tribes Overall: "We had a wonderful holiday, it lived up to and exceeded all of our expectations. 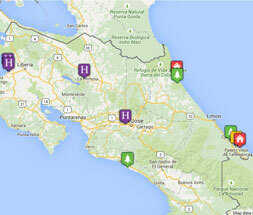 It is a beautiful country and everyone is so friendly Pura Vida - we will be back." Tribes Service: "Very professional and friendly. Prompt response to any questions we had. Great choice of trips and hotels on the tour. Local partner also kept us informed of changes - in particular the rescheduling of the pick up for our return flight. " Guides: "All of the guides and transfer drivers were very friendly and knowledgable. The drivers were prompt and very professional and all good drivers." Social & Environmental Responsibility: "We definitely got the impression that the environment was very important to everyone we met. I was particularly pleased that all the hotels we stayed in were small and appeared locally run, we certainly felt that they were built to fit into the landscape. We were so glad we were not staying in the big chain resort type hotels." Pure Indulgence. I am sure we would have rated the Spa and Gardens excellent but we were upgraded to the Springs side of the resort which was breathtaking. The rooms and setting were beautiful but the staff were exceptional. Especially the bell boys who were happy to take us a trip around the resort in their golf carts to show us the sloths, my husband's name is Tony and he was introduced to his sloth namesake. Great fun. Best breakfast of the trip (and it was a very high bar). A perfect location to relax and contemplate our adventures. This hotel is located right on the beach and happy hour sunset cocktails. Staff and facilities were excellent. None of our party wanted to leave. Right in the centre of San Jose with a very cool and trendy rooftop bar which seemed to attract the beautiful young people of the city. Loved the quirky decor. When we arrived here we all looked at each other and said this will do very nicely. We fell asleep to the sound of the waves from the sea. It certainly set the bar very high for the remainder of the trip. Sorted out a little problem with the rooms very quickly and efficiently - no drama. "There were many special moments, at the end of our trip the four of us in the party sat down tried to choose our favourite moment. We couldn't really choose as we all agreed it was like choosing your favourite child. Each location we stayed at had a different character and all had different things to offer. - sipping beers in a beach side bar on the Caribbean coast listening to (endless) Bob Marley, watching out for falling coconuts. - seeing a mother and baby sloth on the trek through the Cahuita park, - horse riding in Rincon de Vieja with a dip in the hot springs afterwards to relax. The horses were very competent and appeared very well treated and happy. - My husband's face after zip-lining and tarzan swing, he was both terrified and exhilarated and wanted to go again. The Tarzan swing is especially exciting i am told. - the incredible luxury and beauty of the Nayara Springs hotel. We had been booked in to the Spa and Gardens but were given an upgrade to the Springs. The constant rain did not dampen our enjoyment of the facilities, but it would have been nice to have seen even a little bit of the Arenal volcano. - Sunset cruise with Lazy Lizard sailing, beautiful catamaran with open bar, snorkelling followed by a picnic lunch and more drinks to watch the sunset as we sailed back to shoer. - paddle boarding in the Pacific ocean and watching amazing sunsets. - The people we met , all our guides, hotel staff, local restaurants and drivers. They could not do enough to make our holiday one of the most enjoyable we have ever experienced. We have so many wonderful memories and we are already planning our next trip there. "  Flight time: The flying time is about 12 hours from the UK. There are now direct flights from the UK using British Airways. We work with all the major airlines and can offer flights from the UK or via the USA, Panama or a European hub. With the connection times you are looking at around 15 or 16 hours.